In this section I tried, somewhat, to catalog a portion of what I found in the remains of the McKinney and Gainesville Texas PDHs. I guess this is a bit of a "combination" section that shows what a PDH was to be and what remains of PDHs now. I don't have any knowledge of medical items or procedures so I tried my best with the descriptions. Click photos to see larger. 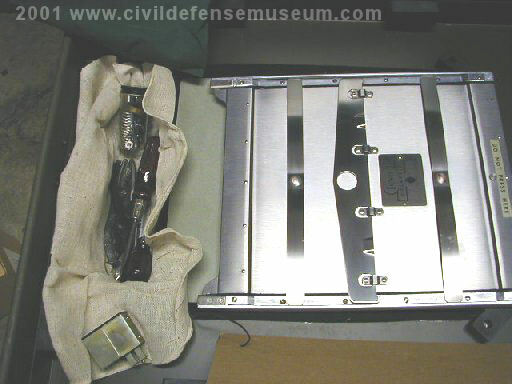 Civil Defense PDHs were equipped with a full x-ray section. 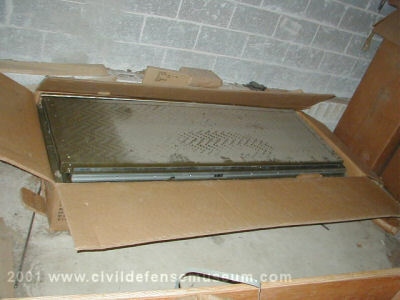 I found the x-ray table with the McKinney stuff beneath a pile of emptied boxes. The table had been opened but was still in new condition. The x-ray tube unit and transformer were long gone from the McKinney PDH stuff but the table was undisturbed. 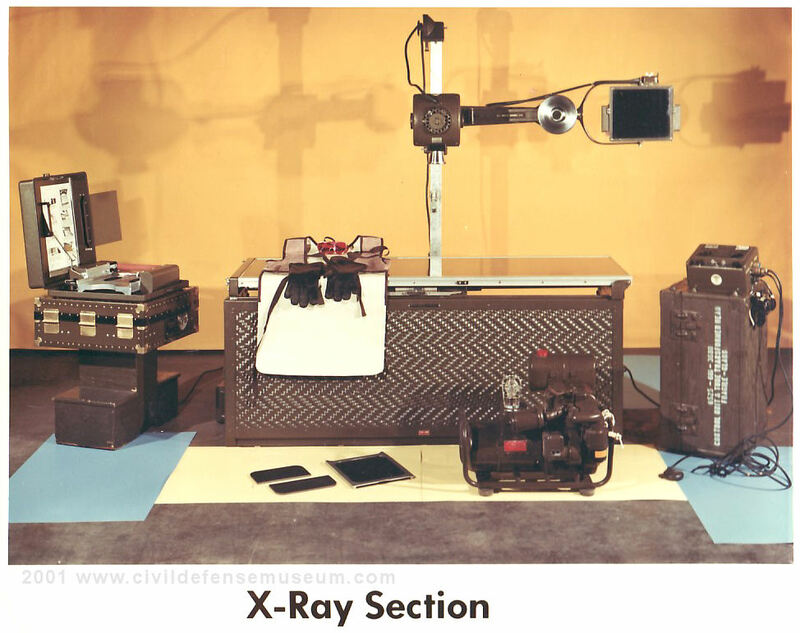 The x-ray unit was to use Polaroid x-ray film. 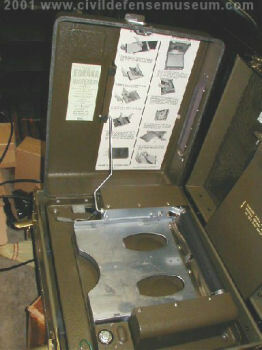 This Picker-Polaroid X-ray film developer was to be used to process the film. Here the case is open showing the developer in the left photo above. The right photo above is the tool kit and film cartridge. All the unit really does is take cassettes of Polaroid x-ray film, pull the film out of the cassette through 2 rollers (just like the Polaroid camera) to develop the film. This is how the x-ray section looked completely setup. Picker-Polaroid developer on the left, x-ray table in the center and x-ray tube and controller case on the right. Small 2.5Kw generator is on the floor in front of the x-ray table. 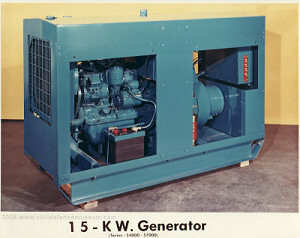 The 2.5Kw generators were only supplied in the Model 57 and earlier PDHs to power the x-ray section equipment. A 1500 gallon water storage tank and pump was supplied with PDHs. The left photo above shows the storage tank crate that I found with the McKinney PDH. This thing weighs a ton. I didn't salvage this because it was so heavy and huge. It is a free standing water tank that is self supporting when filled. See below. The right photo above is water pump for the storage tank. 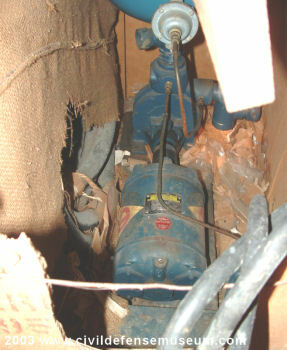 The water pump pictured above was with a Series 57 (1957) PDH that was located in Gainesville Texas. 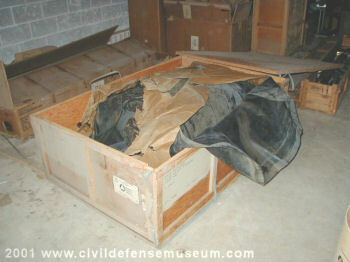 The water pump was still packed in it's crate although the crate had been broken open. I took this photo through a hole in the crate. What was left of the Gainesville PDH came to the same end as the McKinney PDH. The county demolished the building that the Gainesville PDH was stored in. I think the remains of the PDH was still in the building at the time of the demolition. Here's the water tank and pump setup. The water pump is on the right next to the crate. 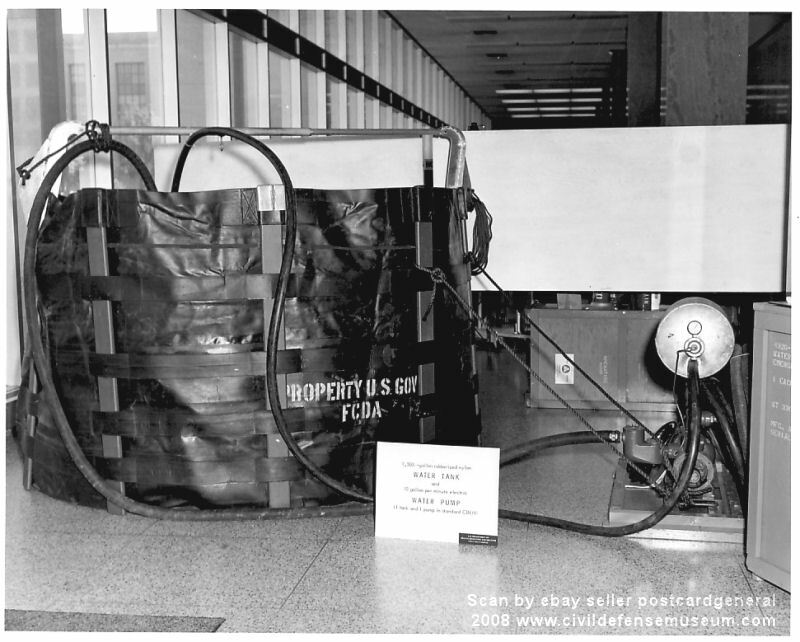 This photo is from a set of photos of a Civil Defense PDH training hospital display. Ebay seller "postcardgeneral" was kind enough to grant me permission to use this photo. The primary generators supplied with PDHs were a 15Kw and 10Kw. The Model 53-57 PDHs were supplied with one 15Kw generator seen in the photo above on the left. 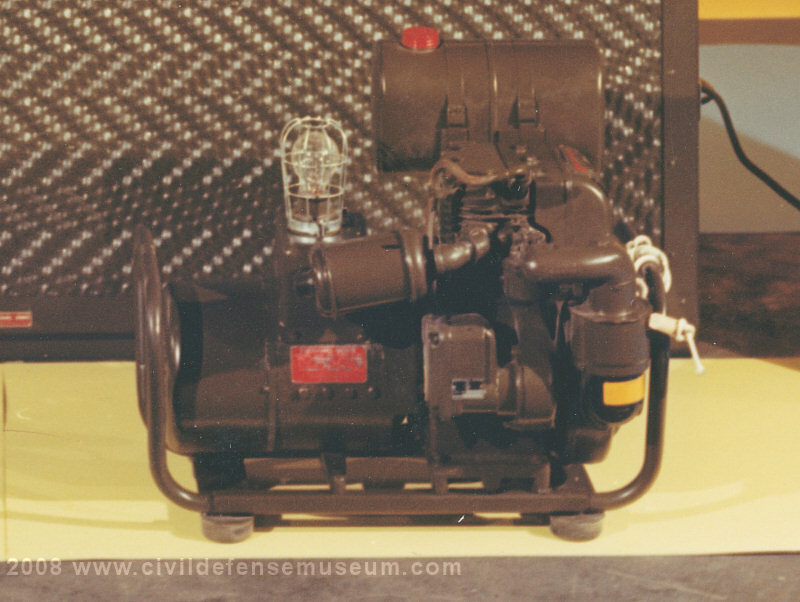 These were gasoline powered generators. The Model 62 PDHs were supplied with 2-10Kw generators as show in the above right photo. There were 5 different models of the 15Kw generator and only one model of the 10Kw unit. 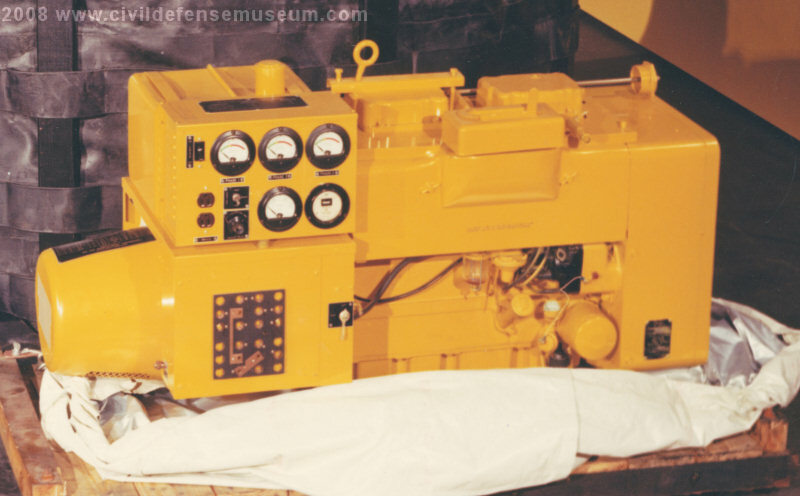 The Model 53-57 PDHs were supplied with an additional small 2.5Kw generator that was to be used to power the x-ray unit and x-ray film developer. 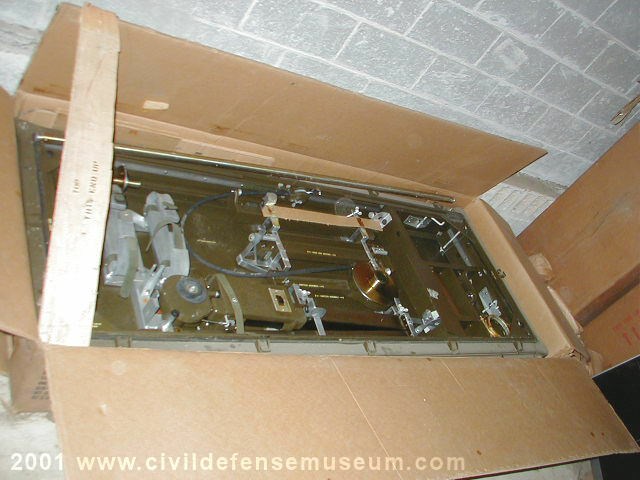 In the later Model 62 PDH the x-ray equipment was to be powered by the 10Kw generators.